Today I decided to keep the hike kind of short. I parked my car in the Lake Tiorati lot and made my way up the blue connector trail that joins up with the Appalachian Trail in three tenths of a mile. Turning left, I immediately saw a Doe with her Fawn. This in itself isn’t so strange, but when they didn’t run as I approached, I thought it would be nice to get a picture. As I took off my pack and took out my camera, fawn actually approached me and stopped about fifteen feet away! Mama and baby checking me out! I was actually very surprised that neither deer ran when they saw me. Continuing on the AT, it was much nicer terrain than when I was on the trail the other day. Today’s section of the trail was wide open and I didn’t experience the closed in feeling that I did hiking around Silvermine Lake! The AT runs parallel to Lake Tiorati in Bear Mt. State Park. My trusty pack on the AT!!!! Shortly after I took this picture, the AT would intersect with a blue blazed trail that leads to the Fingerboard Shelter 350 feet away. Four tenths of a mile after passing the shelter, you end up back on Seven Lakes Road. Turn left and walk along the road (approximately 1 1/4 miles) and you end up back where you started. This entry was posted in Uncategorized and tagged Appalachian Trail, Bear mt bridge, Blogging about Hiking, Henry David Thoreau, Hiking, Hudson River, Hudson Valley, Hudson Valley Hiking, Inner Peace, Lake Tiorati, peace, Photography, tranquility, wilderness photography on July 8, 2017 by The Zen Hiker. Before I even begin to describe this hike, I think I spent too much time telling you how good my new boots were. The reason I say this is because about half way through the hike (approximately 2 miles), I went to step up with my left foot and with my right foot on an uneven tree root, it slid to the left, twisting my right ankle and sending me to the ground. Of course I really can’t blame the boots, but why blame my own clumsiness?? Since I was in the middle of the woods, I had no choice but to keep going. Up, down and over rocks, tree roots and leaves I went, the pain increasing with every step. I really wanted to stop, but I knew that wasn’t possible. So I forged ahead for the remaining two miles and finished the hike. Wow…I certainly am not a baby when it comes to pain, but this really hurt. I’m confident it isn’t broken, but it certainly is sprained. So as I sit on my couch with my foot up on a pillow with a bag of vegetables as an ice pack, I’ll describe what still was a really nice hike! Unfortunately I’ll be of the trails for a few days to let my ankle rest. Parking just off of route 55 in a small parking lot, the initial blue trail lasts from the parking area until it joins the AT. A kiosk just off of the parking lot has a map for the nuclear lake hike as well as the obligatory warning about ticks. The start of the Nuclear Lake hike. Within a minute or two of leaving the kiosk, you will see the AT. 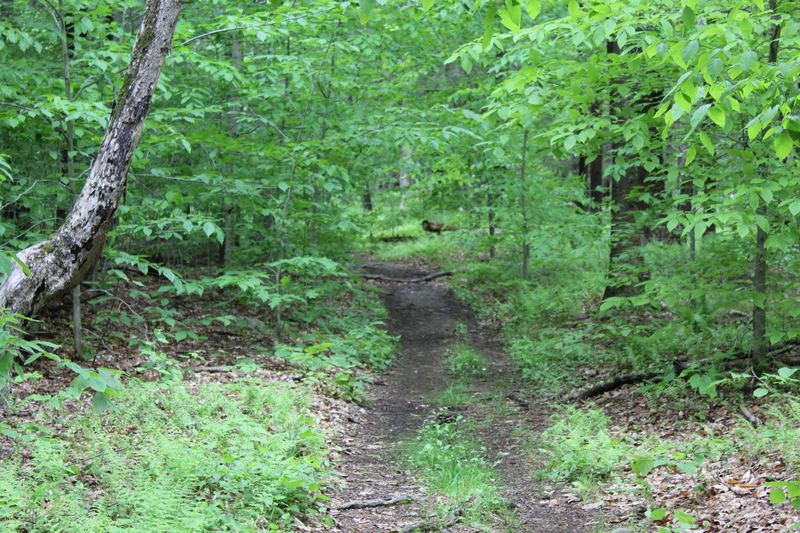 Stay to the left on the AT and begin your journey through the woods. After about 5 minutes you will see the blue blazed Beekman Uplands Loop on the left. Do not take this trail! That is a hike for another day. The AT runs through some very nice woods. The two bridges below make for pleasant distraction as you meander through the woods. Almost immediately after crossing the bridge on the right, you will see this sign on a tree off to the right of the AT. The start of the yellow blazed Nuclear Lake Loop Trail. A section of the trail. As you circle the lake you cross several interesting rock walls. Keep following the Yellow Blazes until you reach the point where the loop ends and meets up with the AT again. Take the left and continue on the AT until you get back to the blue trail that leads back to the parking lot. The end of the Nuclear Lake Loop Trail. A stretch of the AT. The AT goes back into the woods. This entry was posted in Uncategorized and tagged Appalachian Trail, Blogging about Hiking, Blogging and hiking, Hiking, Hiking photography, hiking quotes, Hudson Valley Hiking, hudson valley ny, Inner Peace, Music, Nuclear Lake, nuclear lake loop, pawling ny, peace, Photography, technology, tranquility, walking as meditation, wilderness photography on June 30, 2017 by The Zen Hiker.